How to use Avios for domestic Japanese flights – with no taxes! Whilst I am on holiday, I thought it was worthwhile running an updated version of this article by HFP reader Ricardo which originally ran 18 months ago. It contains valuable advice for anyone planning a trip to Japan. Under the old Air Miles scheme, prior to November 2011, you could redeem for UK domestic flights without paying any tax at all. The addition of what is now £35 of tax via Reward Flight Saver made these redemptions look less interesting for me. If you look further afield, Japanese domestic flights with Japan Airlines offer excellent value. The taxes for these domestic flights are usually negligible, around £3 or less for terminal usage fees. Some airports have no usage fee at all, so you are only looking at the Avios cost of 4,500 or 7,500 points per flight. The real value of these flights has be viewed within the larger context of Japan’s other domestic offerings. Whilst there are several low cost carriers operating in Japan, these airlines offer nowhere near the value one might expect to find in the European marketplace. A promotional ticket with Skymark, now owned by ANA, or Peach Aviation, two popular low cost carriers, is often still Yen 10,000 (£58) each way. Because the choices are limited, customers readily pounce when a promotion is launched and the cheapest seats can sell out within minutes, leaving only the higher priced seats. For someone who is flying at short notice, a cheap ticket is very difficult to obtain. Looking at alternative transport options, the bullet train system (shinkansen) is one of the most efficient in the world, but it’s certainly not cheap. 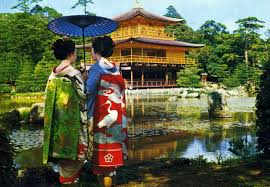 A ticket from Tokyo to Kyoto (2 hrs 19 min) will cost you close to £100 one way. There is no system of discounted tickets for advance rail bookings in Japan which is another reason why cheap airline seats often sell out quickly. There is usually excellent availability on many popular routes with 4 seats being a common number released on each flight for oneworld partners such as British Airways. Booking at short notice is also often possible, although flights falling on public holidays will need to be booked well ahead of time. 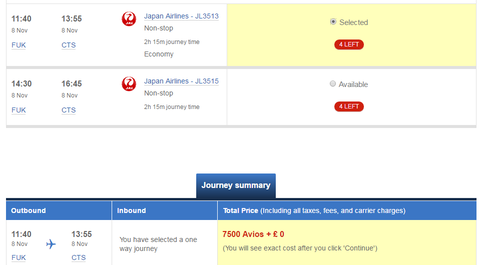 Another benefit of booking a Japan Airlines redemption flight is the cheap cancellation option. Whilst BA will charge you £35 to cancel an Avios redemption, this sum is actually capped at the level of taxes you have paid. With typical Japan Airlines domestic taxes being £3 or less, you effectively have the ability to cancel for free. One odd quirk with the taxes being so low is that when you fly to / from an airport that doesn’t charge a terminal usage fee, you’ll still get directed to the payment page on the BA website – even though no tax is due! Not surprisingly, when the website tries to process a payment of ‘zero’ from your credit card or PayPal, it throws up an error and doesn’t let you book the ticket. You can find your way around this by adding a £1.00 charity donation to your booking just before the final payment screen. The website will process this one pound transaction and happily generate your e-ticket at the same time. If you try to ring the BA call centre instead, you may find that the call centre will be unable to issue an e-ticket. In one instance I was told a paper ticket would need to be issued and that I would have to pay the telephone booking charge. JAL is a great airline. The staff are always at the top of their game. The customer service is second to none on domestic and international flights. There is no light meal on domestic flights which is one downside, but they do serve a beverage and occasionally a Japanese lozenge of some sort! If you are planning a holiday in Japan, flying with Japan Airlines could very well save you hundreds of pounds. You’re sure to enjoy the flying experience and hospitality with JAL while discovering this fascinating country. Happy coincidence – am in the JAL Sakura lounge at Haneda airport, waiting to board a flight to Hiroshima. In addition to the low cost of the redemption flight (£3.40), you can also upgrade to business class for 1,000 Yen (just over £6). This is JAL’s standard policy, and I’m guessing it is possible only at the airport (the JAL website didn’t even allow seat selection or online check-in). Side note: the Sakura lounge offers only light snacks (rice puffs), not food. Beer and whisky are available. It’s a shame there is such a difference between JAL’s international and domestic lounges. I’m always amazed by the efficiency of flying JAL domestic. The crazy minimum check in time, efficient boarding and no liquids restriction in hand luggage. It makes it all in a ll a very pleasant experience. Domestic flights in Australia and NZ aren’t too bad either. Or South America! Lan and Qantas domestics are my two favourite redemption options. Agree, QF domestic redemptions are superb value given the extremely low taxes! Nice onboard service too. The same is true using Virgin Flying Club miles on Air NZ. Recently booked a return Auckland-Queenstown for 15,000 points and zero pounds and pence. Needs to be booked over the phone, mind you. For what it’s worth, the Sakura first class lounge offers a lot more food (for those of you who have OneWorld emerald) – there’s miso soup, Japanese beef curry and depending on the time of the day, they have different dishes they cook/make on the spot (sushi, french style egg galette). They also have the usual food fare of sandwiches and a small salad bar. Yes, we were in there this morning, straight from the BA flight awaiting the flight to Fukuoka. I like the Jal Global security channel straight to the escalator for the lounge. We went straight to the soundproof kids room which is strangely devoid of toys! Love also the view across the apron but yes some food apart from rice puffs and cheap biscuits would have been nice! Great article however some data points. I have booked via tha call centre for zero cost taxes. Was not easy but in the end it all worked out. Sadly JAL then cancelled the flight. Very common in Asia and Japan. Secondly getting to and from airports in Japan can be very much higher than the £35 reward flight saver. It’s true there are few discounted rail fares internally in Japan. That said foreigners and non residents can get fabulous deals via Japan rail passes. These are only available outside of Japan but they are readily available and great value. In my view better than some free Avios domestic flights. I got mine via amex travel and the website Japan.com is a fabulous resource. Paul, I didn’t know you can get the JR Pass through Amex – thanks for the heads-up. Just to second Paul’s comment, the JR Pass is insanely good value. I have just arrived in Hiroshima after a few days in Kyoto (having previously flown into Narita) – the pass has already paid for itself, and I’ll be using it to travel back through Japan for the next week. The only time I can think of when flights would be better is if you are making a long distance, single city trip. Even then, you need to account for airport location vs arriving in the centre of town on the bullet train. Agreed, in Japan now, rail pass makes much more sense than redeeming for avios. Japan rail also offer many local trains in a lot of cities as well, furthering the value I got. You can get unlimited travel on Japan’s train system, nationally, for around £180 for a week. This INCLUDES the Shinkansen bullet trains all bar the quickest Nozomi service. They are fantastic to travel on. Always worth taking a look at these domestic fares when traveling to Japan on a one world airline. Tickets for a flat fee of around £70 on all domestic flights. They are a little bit fiddly to book – I had to book through the London JAL office and send a scan of my passport to prove I was not Japanese. It also allows an at-airport upgrade to Business class for a stupidly low £6.50. You only get a bigger seat (a bit like WT+) but on a return, £13.00 for an extra 60TP was a steal. No problem with upgrade availability for Tokyo – Ishigaki. Last note is that while you have to fly into Japan on a one world airline, a redemption booking is fine for this. Great article. Good to know that miles can be used with little or no taxes. A bit off topic, but anyone know what’s the best way to redeem on South African Airways? What’s the best partner to redeem? Star Alliance so pick from 29 airlines! Good article, no new info for me though. I thought I should say though that whilst JAL are pretty good internationally, their domestic product is very bare bones- not “great”. True, the staff are very polite, but drinks choices are very limited (and not normally what you’d expect), and lounges are very basic. Same is true of ANA. Also, i’ve picked up some very cheap fares on Peach and Jetstar. They aren’t always more expensive. The JAL “Sakitoku” advance fares (2-3 months prior to date of departure) are really good. I got J class Haneda – Naha for 9,990 yen (£65 incl. AMEX fees). The one-way flight gives me 820 avios and 40 TPs. worth pointing out the bullet trains are brilliant – comfortable, clean and punctual, so if in Japan for a week or more worth buying a JR Rail pass. Another recommendation for the JR Pass. Also good for many of the local railways and the metro in Tokyo, although some lines are private and not included, but the real saving is taking Shinkansen a few times. Remember to book the JR Pass in good time before you go. Also a recommendation for travelling through Haneda if you can. The journey to/from Narita is a bit of a chore. A couple of other pointers. Jetstar recently started flying domestic flights in Japan and I have managed to book fares for as low as ¥2,500 one way with taxes. With JAL and ANA having a very loyal customer, it seems that Jetstars strategy is put themselves as the go to airline when a customer is looking for the cheapest fare. Flights are often delayed though with a much smaller fleet than their big rivals. Internal flights can be booked on ANA using Virgin Flyer miles, 15,000 miles being the charge for all round trip bookings regardless of distance with no taxes again. Seats can only be booked on ANA operated flights and not their subsidiaries, like ANA wings. Bookings can only be made through the Virgin Flyer Club call centre. While the Japan Rail Pass has been offering up exceptional value for many years, it is a pass that is great for the regularly plied routes in Japan, Osaka, Tokyo, Hiroshima, Fukuoka etc. The recent extension of the shinkansen to Kanazawa being a nice addition. After a second or third visit to Japan, this is where you would definitely see some great value in getting to places that are more off the beaten track. Two examples would be Memanbetsu up in Hokkaido for access to one of Japan’s most scenic national parks, Shiretoko. 15 hours by train, 1 hour 40 mins by plane. This area is popular with Japanese tourists. Another example would be Kagoshima in Kyushu for Sakurajima volcano and the old samurai districts. 7 hours by train, and again, only 1 hour 40 mins by plane. If you want to reach the places less frequented by tourists that give a more realistic feel of what it’s like to live in Japan, then the internal flights are the way forward. Japan’s tourist numbers are skyrocketing in the last few years, so for me, researching and flying to distant and hard to reach places in Japan have always offered great value when using Avios. Even with a Japan Rail pass, I’d certainly never overlook a flight thrown into that mix. Fly down to Kyushu and then take a week or two on a Japan Rail Pass to slowly make your way back up, this would be a great use of 4,500 miles combined with the cheap rail pass. If you bring up a route map for JAL and look at all the different islands that are served. Choose one of these islands, fly there in under a few hours and experience another face of Japan that is truly authentic and often unexpected. Great post. I lived in Fukuoka, Kyushu for two years and can recommend that city (for its Hakata ramen) along with what I consider the best hot spring in Japan: Kurokawa Onsen. Basashi (horse meat sashimi) also be tried in that area – delicious. To add to Ricardo’s comments, if heading down to Kagoshima to see Sakurajima, go to Ibusuki for the sand onsen (being buried in hot sand by old women and then having a normal hot spring afterwards). I did the sand burial, but further north, possibly around Beppu. And the horse in Kanagawa! Bit O/T But does anyone have any ideas to use etihad or avios to get from Bangkok to Koh Samui? It seems that Bangkok will allow me to credit flights to Etihad, but not to use my etihad mies!? Direct flights BKK-USM are the exclusive terrain of Bangkok Airways and Thai Airways with Bangkok Airways running 90% of the flights. With the number of safe haven tourists spots decreasing and the fact Koh Samui is now firmly on the Chinese tourist map, flights to USM are not cheap anymore. For example Xmas 2016, we were looking at £200 return per person for the 1:15 hour flight. What I did though was move 5000 of my Starwood points to JAL. You can use JAL miles to book on Bangkok Airways for 5000 miles round trip BKK-USM. This is a discount mileage promotional opportunity which lasts until next year March. You can of course fly to Surat Thani with Nok Air then get a bus to the pier and jump on a ferry to Koh Samui but with my young family in tow this was rather an unappealing prospect at the height of the tourist season! have you checked the cash price? it should not be that expensive. It was only about £180 each return… but then again I only paid £600 return from OSL in J ! We flew Haneda to Takamatsu last November to get us to Naoshima (bus direct to ferry port from airport) – was much simpler than getting to a shinkansen station on 2 trains on the way back via Uno. Shinkansen is fantastic if you don’t want to stray too far from the main lines, and if you’re going to Hiroshima or a similar distance, even one way, then a rail pass is worth it immediately – for our itinerary last year, the internal flight and individual train tickets worked well. It’s down to head for points that we’ve managed to get to Japan the last couple of times in premium cabins, so big thanks to Raffles. Good trick for status run if those weren’t credited by error!